- Bug fix: In name customization window, bad display of default category and default short name for clothings with customized name. - UI a lot more compact, as a large column of text is replaced by a thin column of icons. The good news is that now, an update of Elga will not be needed simply because new colors appears. The bad news, with this behaviour, some clothing which were sorted correctly thanks to the predefined list are now left to their own device. But the next feature is here to fix that. It's the name of a hamlet in Norway (Funcom country) and of a wardrobe line of a rather famous northern europe furniture brand! It's also the (temporary?) name of an add-on to help use the in-game wardrobe. Are you fed up with endless scrolling when choosing clothes? Are you fed up with having to juggle between vendors to choose a nice outfit, without being able to preview clothing from various vendors at the same time? Elgå may be able to help you. The user interface makes browsing clothes more enjoyable: by grouping clothing which are only different by colors and providing a bigger interface for clothing selection. You can check the clothing on sale at multiple vendors simultaneously too. The top left window is the main window, shown by default, where you can browse your wardrobe. The top right window is the export window, opened/closed by the button with a file and an arrow, next to the search field. The bottom left window is the name customization window, opened/closed by the button with a pen next to the previous button. The "Wearing" icon line shows which items of clothing your character is currently wearing. On mouse-over, a tool-tip display the clothing name. On click, the item will be selected in the lists. The "Preview" icon line shows which items of clothing are currently on preview on your character. By mouse over, the clothing name is displayed. If you don't own the clothing, the price and vendor will be shown too. On click, the item will be selected in the lists. The button "Wear all" will equip all currently previewed clothing (if they are in your wardrobe, you can't steal the vendor). The button "Preview reset" resets the icon line "Preview" with the content of the icon line "Wearing". Useful when your character clothing preview is lost, because the add-on is not able to detect the loss. The checkbox "Show vendor's inventory" is used to ... filter the vendor's inventory. The field with a magnifying glass is used to filter clothes. ie: write 'red' to only have clothing having red in theirs names. When selecting a category containing clothes, the first cloth of the category is selected (activating the preview). - the icon columns on the list show where you are in your wardrobe by a small shift, click an icon to switch to another type of clothing. - the checkmark on an element shows that the character wears this item of clothing. - if instead of a checkmark, you see a '$' sign, it means you have not bought the item yet. You can see the preview but not wear it. - A triangle means it's a group containing other groups or clothing . - By clicking on a clothing (no triangle), the clothing is previewed. The "Preview" icon line is updated. - By double clicking on a clothing (no triangle, no '$', no checkmark), the clothing will be equipped. If the clothing was already equipped (checkmark), it will be unequipped (exception for legs and torso). All other clothing previews are lost. Load Elgå simply by opening the buy/sell window of each merchant once (you can close it right away). At the next Elgå window opening, the clothing will be available for preview. You will have to do it again at each logging in of the character. This functionality allows you to use the preview of clothing of various merchants simultaneously. The "Show vendor's inventory" check-box must be checked, of course. By selecting a cloth in the main window, his information will appear in this customization window. * the custom name. If this and the previous field are empty, no customization is applied. * make the clothing return to it's default value. the customizations are deleted. You must save to have the effect apply. * refill the text fields to it's current value. So it will change the textfields text only if you modified them and did NOT save. * save the changes you made for the last selected cloth. The main window is direclty updated. * one to import your clothings name customizations : it will open a new window asking what type of import you want. - To empty an item slot by preview (like removing a hat). The only known way is to remove the clothing, which resets all the previews. - Detect when the preview is lost (ie: by moving the character) to update the "Preview" icon line. What I don't want to do currently with the add-on. - Buy clothing through the add-on. If something goes wrong with your money, I certainly don't want to be held responsible. - A new "fake" clothing placement which will regroup clothings by sets (considering a cloth name containing the text " - " has the set name before said text). - Customization of the defaults categories. Why is a cloth badly sorted ? 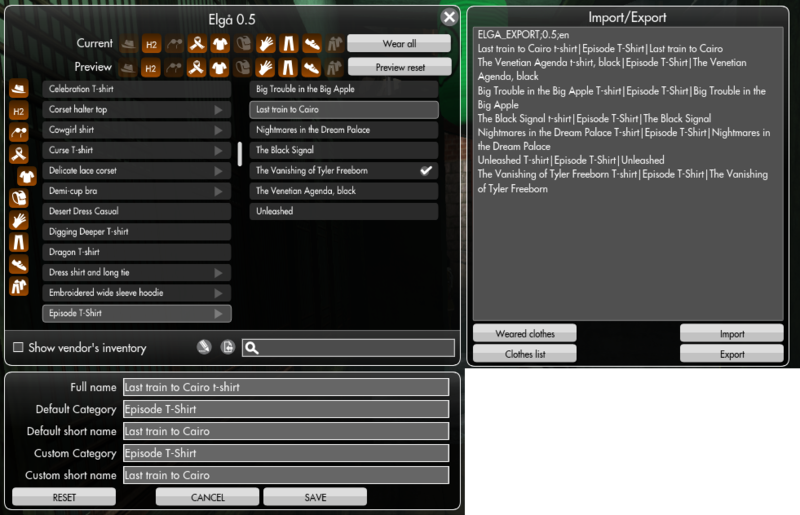 Since Elga 0.5, rather than trying to look for some colors, Elga will simply cut the name of the cloth after the virgula and considers the last part as the color, as it fits Funcom current naming convention most of the time. For the few times it does not work, you can use the name customization (by yourself or through an import) to correct the sorting. - Better translations in the addon or this post. English is not my mother tongue. My German is so terrible I need to use Google translate. Catagorical for providing an example add-on. Viper for helping with the add-on integration by providing an example. - Text correctly aligned in list. - Ordering of first list matching the game default wardrobe. - Better management of clothing from sets without color in the name. 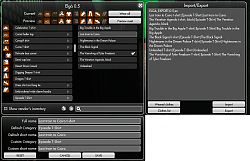 - Update for TSW Episode 9 API changes. - Update according to TSW Api changes. - Bug preventing to see the 'Innsmouth academy hoodie, white with blood' should be fixed. - Distinction between zipped and unzipped "Striped hoodie jacket"
- Better explanation in the readme file to remove the initial release installation. - To move the button, drag it with a right click. - Simplified installation. Only one folder to move. Warning: If there is an Elga.swf file in your Flash directory, please remove it. The color is split of as "brown" instead of "deep brown"
When splitting of the color from the main description, it would look better if you removed the , (comma) from the end of the item name. "deep brown" will be added to the list of identified colors. Thanks. I will probably do something for the comma too. Please add a "None" option to the slots where it is possible to not wear anything, like the head, face, back, hands, etc. I am a bit annoyed for the "None option". If it's here, users could expect to use it to have a preview of "none", and it's not possible (as far as I know). Or I should write "None (no preview)". Hint: To remove a cloth, I usually select the cloth with the "Wearing" icon line, Elga points to it in the list, then I double-clik it in the list. Love this addon but i have found a small mistake and have a suggestion. Ouch! I forgot to explain that in the readme file. Sorry. Fixed in 0.2.1. Last edited by Gongju : 08-18-2012 at 05:53 AM. I hope you will add outfit management in the future, as well, which allows for naming of outfit 'sets'.